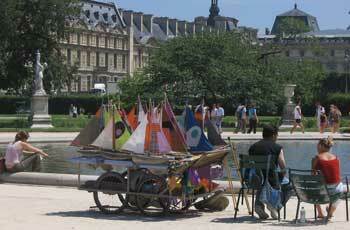 Little sailboats can be rented at the Tuileries. That’s the Louvre in the background. That is where Dan and Mary are today, I think. 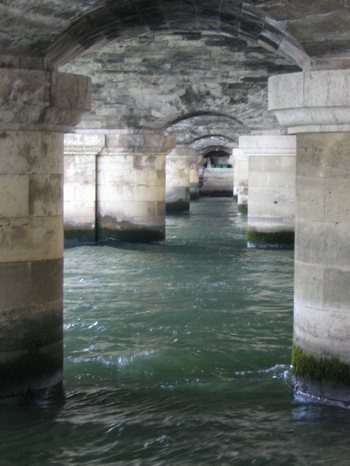 A view of the Seine from beneath a bridge. 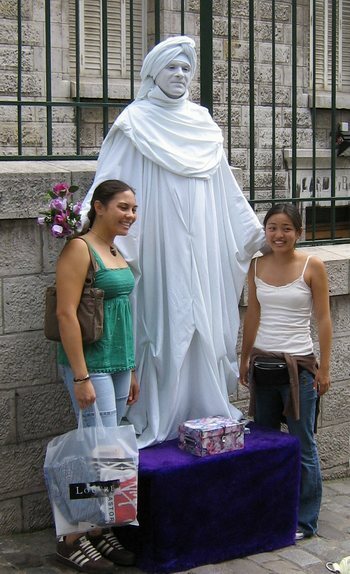 The white mime of Montmartre. 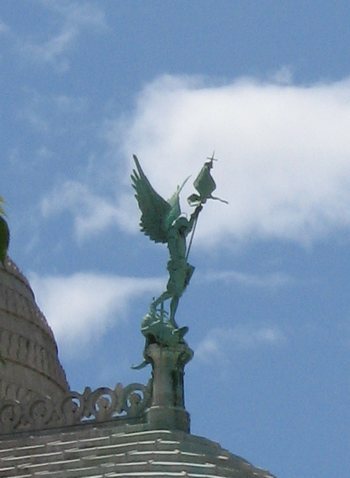 St. George, atop Sacre Coeur. Well, it turns out that what Lance said on the ESPY show was just one of many ridiculous things he said in what was supposed to be a comedy monologue. The French news media took the one sentence about the French soccer players completely out of context. Lance has implied that the French news media have no sense of humor and could not appreciate the context. I read the entire news story about a problem of “amiante,” thinking that surely I could figure out its meaning from the context. But the context just left me confused. According to the French/English dictionary, “amiante” (noun, masculine) is asbestos. Ten years ago, President Chirac promised that the asbestos would be removed from the campus at Jussieu (on the outskirts of Paris, where many university buildings are located). The anti-asbestos committee of Jussieu recently wrote an open letter to Chirac to remind him of his health and security obligations in this matter. So far, only 20 percent of these buildings have had the asbestos removed and have been renovated. 37 percent are in the midst of the work. In 43 percent of the premises, the asbestos is still there and the university activities just continue as if nothing is wrong. This public health scandal is also a financial scandal: the total cost of the operation will be 1.4 billion euros (1.75 billion dollars), but only 65 million euros have been allocated so far. That is less than 5 percent of the total amount needed. I had a great walk all by myself the other day from the FNAC store on boulevard Saint Germain back to the apartment. I was stopped by French women three times so they could ask me for directions to this street or that. In each case, I was able to tell them exactly where that street was located. They each looked very pleasantly surprised to hear my foreign accent. They must have assumed I was French. So, the reason I don’t see many French people carrying maps of the city is that they just ask each other for directions, I guess. I am proud to say I know the streets of Paris well enough to be a guide. That brand-new floating swimming pool that I told you about earlier (in the Seine, near the Mitterand Library) has had to be re-tiled. Supposedly it should be open for the annual Paris Beach (Paris Plage) event that opened on the 20th and continues for three weeks or so. We’ll check it out on Sunday, when we can walk the entire length of the Paris left bank of the river to get there. Paris has a project in the planning stages that calls for building gardens over the highway surrounding Paris (the “périphérique”). That means there will be more sections of tunnels, and more public spaces to be maintained. The gardens will include 7,000 square meters of terraces with games for kids and a restaurant/kiosque, as well as 2,500 square meters of area dedicated to sports. Public meetings on the proposals are planned for Spring 2007. The areas affected are the 14th arrondissement of Paris and the suburbs of Malakoff and Vanves. The project should begin in 2008. Simone-de-Beauvoir needs support. This new pedestrian bridge over the Seine (near the new floating swimming pool) evidently shakes when people walk on it. It is one long span, with no pilings in the river itself. The architect has made his excuses, but it seems that braces will be installed. 1. It has been too hot. 2. Tom and I are too busy watching the Tour de France in the afternoons. 4. Yesterday, the Noos cable service (for TV and internet) was off all day long. Fortunately, one can still watch the Tour on French national TV with just a TV antenna. Yesterday was the most exciting day of the Tour. Floyd Landis made a spectacular comeback. 5. We spend every evening out at dinner with Dan and Mary (le diner en famille, c’est très important). 6. Maybe I’m getting lazy. 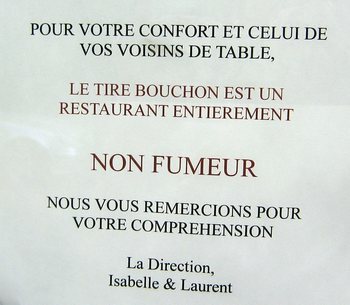 The restaurant where we are going to meet friends tonight, Le Tire Bouchon, is now entirely non-smoking!